What every girl needs sometimes is a GIRLS NIGHT! Lucky for me, one of my girlfriends Colleen is in agreement that every good girls night should start with some GOOD FOOD! Colleen took me to a small bar in Conshohocken called The Gypsy Saloon. We got there pretty late, so there was already a DJ blasting some dance music. There were still a few tables left for dinner service, so we picked one in the corner so we could chat. With the exception of the LOUD music, the place was awesome. It took us forever to decide on what to order since everything on the menu sounded delish. 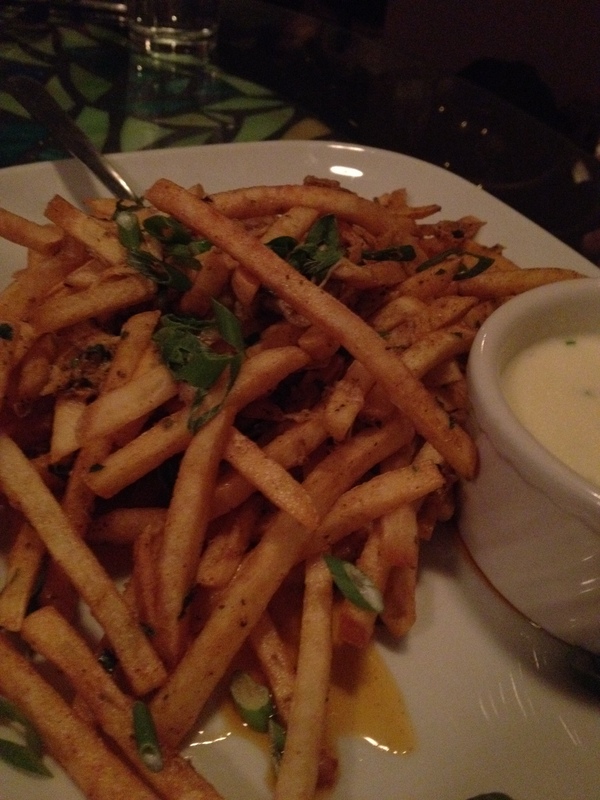 We started off with drinks and an order of the Island Grill’s Crabby Fries. The fries were unbelievable. I actually can’t stop thinking about them! I’m afraid to say it but they are better than Chickie’s and Pete’s FAMOUS Crab Fries. They’re that good! The fries were perfectly hot and crispy, and they were tossed with huge pieces ofOldBay sautéed crabmeat. Colleen had been here before and made a special request to add the “Italian Fondue” side of cheese dip that comes along with the other type of fries. MMM! For our main dishes, Colleen ordered the Blue Cheese Flatbread and I ordered the Blackened Salmon. The size of the serving of salmon on my dish was huge! 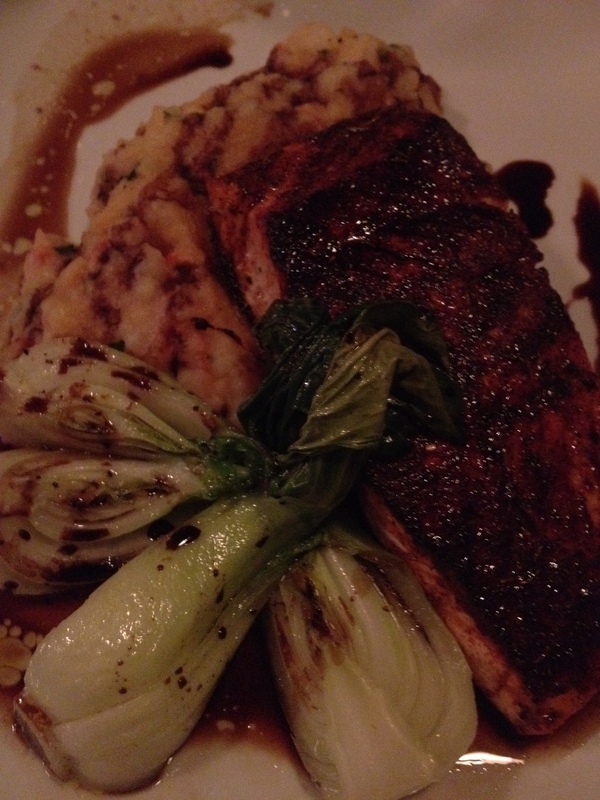 It was blackened and served over lobster mashed potatoes and sautéed baby bok choy. They also topped it off with a reduced balsamic drizzle which was a nice tangy counter to the overpowering flavors from the blackening seasoning. Colleen’s Blue Cheese Flatbread was mouthwatering. Literally- I was still on my no-cheese diet and refused to try it. I LOVE blue cheese and this flatbread had my name written all over it! 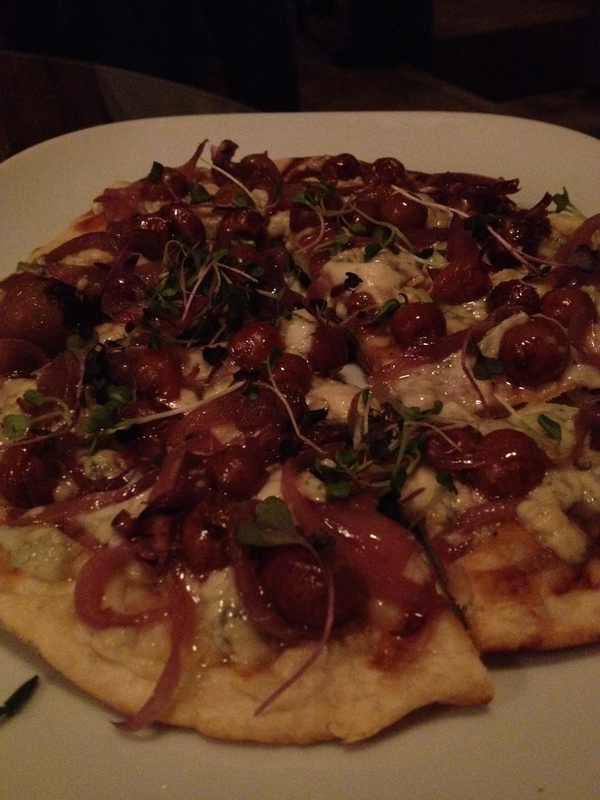 The flatbread was smothered with melted blue cheese and topped with caramelized onions and roasted red grapes- how interesting! Colleen said it was really yummy. I loved girls night, and we plan to have another one soon (so we can try Gypsy Saloon’s signature Lobster Mac & Cheese) ! !